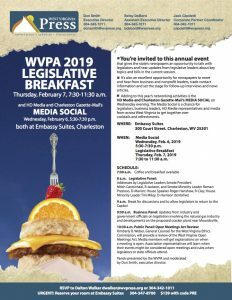 CHARLESTON, W.Va. — Legislators, media from across the state and guests will gather at the Embassy Suites on morning of Feb. 7 for the annual West Virginia Press Association Legislative Breakfast. The Feb 7 breakfast is from 7:30-11:30 a.m. at Embassy Suites, 300 Court Street. Charleston, WV 25301. 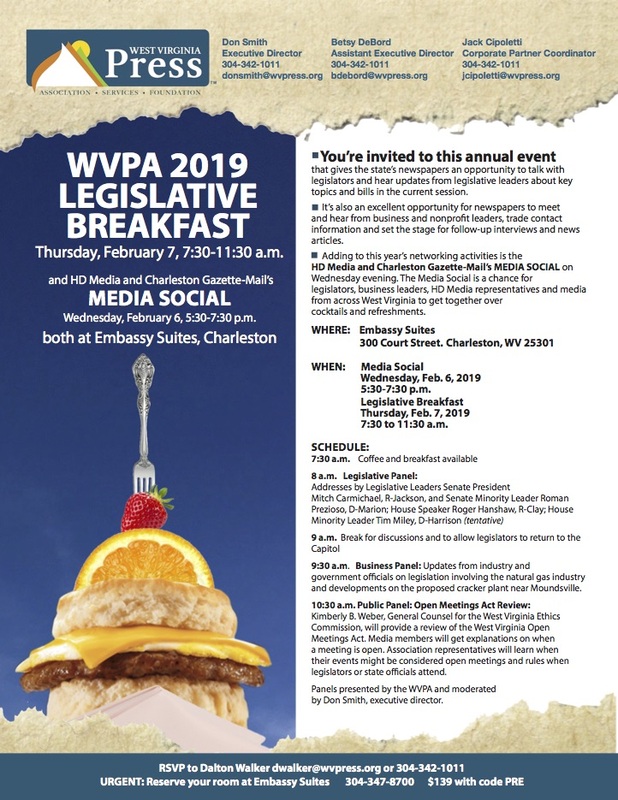 In additional to legislative updates, those attending will hear a business update on the natural gas industry and a review of the W.Va. Open Meetings Act from the West Virginia Ethics Commission. Adding to this year’s networking activities is the HD Media and Charleston Gazette-Mail’s MEDIA SOCIAL on Wednesday evening, the night before the breakfast. The HD MEDIA SOCIAL is Wednesday, Feb. 6, from 5:30-7:30 p.m. and is also at Embassy Suites. 9:30 a.m. Business Panel: Updates from industry and government officials on legislation involving the natural gas industry and developments on the proposed cracker plant near Moundsville. 10:30 a.m. Public Panel: Open Meetings Act Review: Kimberly B. Weber, General Counsel for the West Virginia Ethics Commission, will provide a review of the West Virginia Open Meetings Act. Media members will get explanations on when a meeting is open. Association representatives will learn when their events might be considered open meetings and rules when legislators or state officials attend. The panels are presented by the WVPA and moderated by Don Smith, executive director.